The 2019 Lift & Co. Cannabis Business Conference and Expo was hosted January 10th to 13th in Vancouver by Lift & Co (TSXV: LIFT). It was an immersive and educational event unlike any other, highlighting hundreds of Canadian and international speakers and exhibitors who invested significant capital to grow visibility and recognition for their brands. Exhibitors spent upwards of six figures on booths at the Vancouver expo to engage more than 18,000 attendees — a clear sign that the Lift & Co. Cannabis Expo provides a much-needed marketing avenue for companies working under marketing and advertising restrictions imposed by the federal government. The recently legalized cannabis business sector is flourishing, to say the least, as thousands of producers, consumers and retailers gathered at the four-day event. Lift & Co. reported a 60 per cent increase in exhibitors, covering a footprint at the Vancouver Convention Centre that increased by 90 per cent in square footage versus the 2018 Vancouver Expo. From new and innovative products to ample connection opportunities, the event functioned as a microcosm of the excitement felt across the consumer packaged goods-like industry as a whole. Lift & Co. serves a vital role in the growth of the cannabis industry’s value chain. Each of the guests that attended the expo, as speakers, exhibitors, consumers or investors, are doing so in order to gain industry information, contacts and visibility in a space. Lift & Co.’s ability to forecast this pain point and be ready to serve it is an accomplishment that cannabis stakeholders are grateful for. Lift & Co. Corp (TXSV: LIFT) CEO, Matei Olaru, spoke about what makes his company exceptional, while also exploring key differentiating factors of this conference. He also discusses significant industry trends expected to accelerate growth and transform canna-business models moving forward. Recently listed on the TSX Venture Exchange, Olaru describes Lift & Co. as a technology company, with a distinctive ethos. “We are very much a picks-and-shovels play, aggregating marketing spends and marketing data from producers, retailers and consumers — the conferences are a form of event marketing,” he stated. With the value proposition of Lift & Co. clear, it was evident that the expo was just one aspect of Lift & Co.’s more significant mission to “educate and empower” Canadians as they are exposed to the dynamic legal cannabis ecosystem. One way that Lift & Co. is helping to prop up and educate on the canna-business world is through the Expo’s pitch competition. 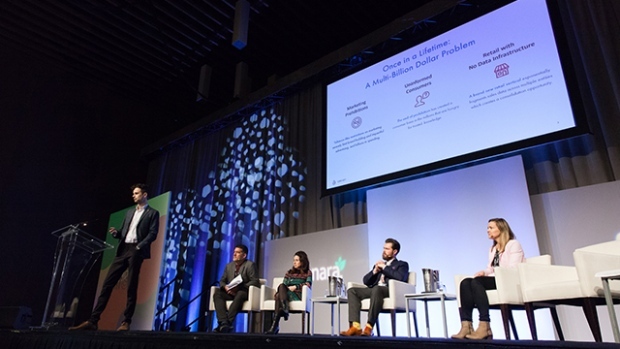 By giving new businesses a platform to pitch ideas in front of industry professionals, judges and executives, the industry gains traction and legitimacy as a budding branch of the Canadian business world. “Eventually, there will be a ‘green’ version of a Dragon’s Den or Shark Tank-style show. The market is big enough, and the demand is there. It’s not our end goal but we’re confident that our pitch competition is a precursor to a broader global movement in the future,” Olaru acknowledged. To stimulate this initiative, the expo included the first “Women’s Zen Lunch,” hosted cooperatively with Zenabis, a publicly listed Canadian LP. The event functioned as a networking session, exploring keynote topics ranging from inclusive leadership to workplace diversity and beyond. Lift & Co.’s 2019 Vancouver Cannabis Expo served as a highly informative event, tackling many major trends bound to impact the industry moving forward. Amongst the trends driving industry growth is data analytics. As Olaru puts it, “The importance of data analytics is rising as the industry moves towards consumer-packaged goods (CPG).” With various speakers and exhibitors sharing this interest in data analytics, the Lift & Co. Conference made a concerted effort to emphasize the importance of this growing movement. Consumption by demographic is another metric of interest, as producers across the industry begin to rely on sophisticated data to dictate product development and marketing practices. Beyond marketing and branding, new legislation south of the border marks a significant milestone for the industry. The recently passed Farm Bill in the U.S. — which legalized industrial hemp, removing it from the illegal Schedule 1 drugs list — is set to reduce barriers for CBD and hemp-based products. The future of Lift & Co. Overall, Lift & Co. is establishing itself as a ground-breaking figure in the Canadian legal cannabis space, through a multi-faceted vision and one-of-a-kind execution. Its wide-ranging initiatives, which include technology, data, content and education has allowed the company to become a true pioneer in the sector. The Expo held earlier this month was a prime example of just how far the industry has come as a whole, from producers to consumers and everything in between. The attendees came from unique backgrounds, and the excitement in the building was palpable. Olaru was able to provide significant insight on what his company does and where the industry is headed. As the cannabis sector firms up initiatives such as diversity, data analytics and the transition to CPG-based business models, companies such as Lift & Co that aim to inform through consumer education and data insights, are indispensable to the sector’s development. Positioned and ingrained throughout the value-chain to play an integral role in the growth of the industry, Lift & Co.’s Canadian business model is internationally scalable, and their Canadian prominence is already creating a first-mover advantage into international markets that are following in Canada’s footsteps. Visit Lift & Co. online for more content recapping the event.